Guys, look, it's coming along! Here's the current state of our parlor. The rug I've been waiting ages for finally came. I love it. 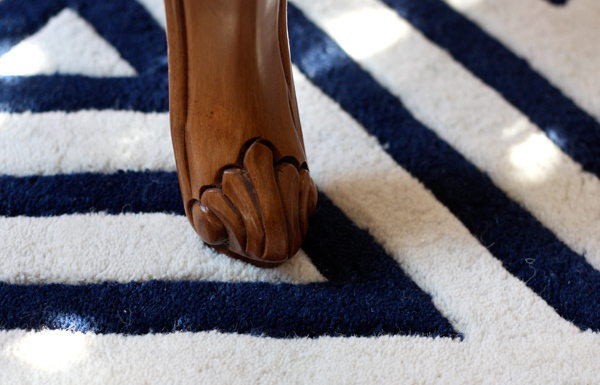 It's the Momeni Delhi DL-51 Navy rug. I ordered it from Rug Super Center since they provide a free rug pad with your order (the pad is still in transit, so I'm not sure what kind it is.) 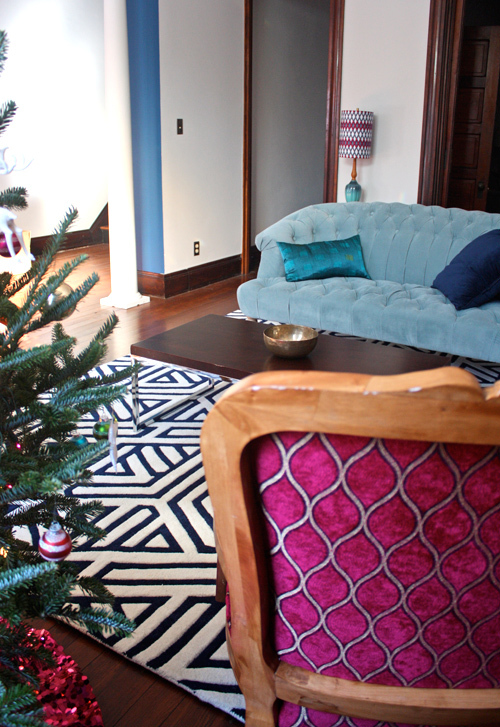 We'll move the rug closer to the window so it's more centered in the room after the Christmas tree is gone. We're still waiting for a non-broken chandelier to arrive; that will be in January. We also want to ditch the bathroom floor tile covering this non-working fireplace and probably paint the brick to hide some ugliness. Alex got out the roasting rack from his grill and put a couple logs in it, just to help the situation a little. We bought that firewood bundle circa 2004 for a campfire in Chicago that never happened. And then we moved it to Cincinnati this summer. Finally it has a purpose in life. 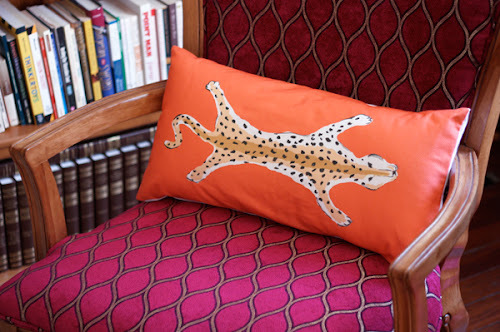 I guess interior designers would put lots of stuff on the mantle and style up the coffee table with deer antlers and art books that no one reads. I'll work on that. 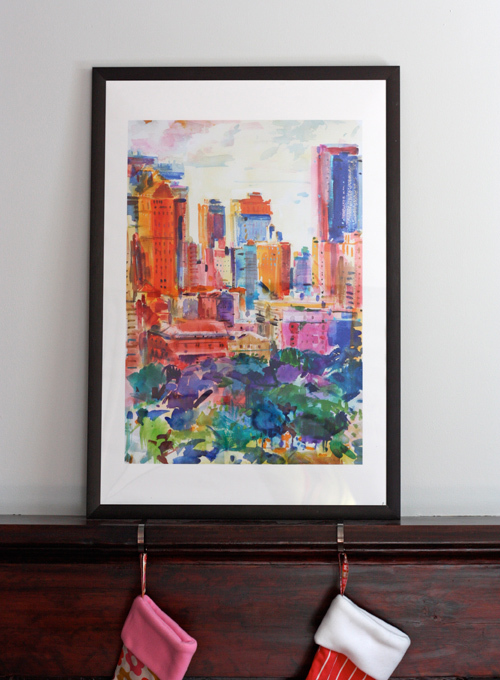 In the meantime, I cashed in some Groupon credit and got this lovely watercolor print for free from art.com. Central Park West, 2011 by Peter Graham. And I made a deal with Ms. Dana Gibson to get a discount on her awesome painted leopard pillows. They make me smile internally when I look at them. I was fixated on this funny tiger rug awhile ago with nowhere to put it, so now I have achieved my dream of owning flattened animals. (I don't count paper bookmarks. The comments on that post are hilarious, by the way.) Side note! Dana's great grandpa was the artist behind the Gibson Girl. Also in here are the antique-mall lamps with shades I covered, the reupholstered Craigslist chairs, and the Abigail loveseat whose legs I intend to stain darker. Oh, Jess, it's gorgeous. First time ever that maybe orange isn't first pick, but the transformation is wonderful! It looks awesome! Everything has come together so well. It takes a lot of vision to look at an empty room and turn it into a cozy, personality filled space like you did. It looks great. I ordered that same couch from World Market after I saw it on your blog! It's going in my master bedroom once it arrives this week. Squeee! Can't wait. Amazing transformation! Thanks so much for sharing the steps and the final product. So great! I love that you stay true to the period of the house but let your modern taste come through too. love all of this, looks fantastic, can we see the other rooms to when done? Very inviting. Many will step into your parlor! I'm really enjoying the transformation of this house. Love it! One thing I've seen people do with the fireplace is fill it with different height pillar candles. It always brings warmth to the room. Soley, we're looking into what kind fire options we have for the fireplace, but if those don't pan out, it's candles for sure. I like the idea of different heights of pillars--thanks! LOVE IT! You've pulled it all together in a very lovely, warm way. I'm super impressed even without any coffee table books (I've never understood the purpose of those) or a stylized mantel! Well done! I officially dub you a "pattern master"! Nice combination of patterns. It looks really cool. I think we may have the same clock. Love it! Truly impressed with how you layered so many bold patterns & colors....and make it all look so fun & inviting & beautiful. I remember when you showed us each separate piece (the chairs, the sofa, the rug, the lamps, curtains, etc) I was wondering how it would all go together, but seeing them together in the room -- WOW! I need to learn from you. Right now, our living room looks blah. I love all of it! The colors! The patterns! The tree! You really made it look exactly how I would imagine your home to be decorated: colorful, comfortable, and chic. Such a welcoming room! 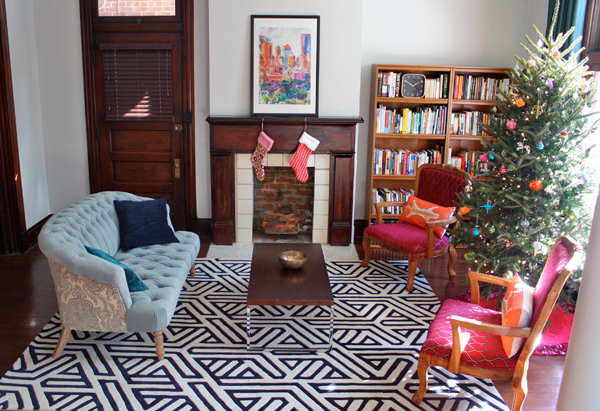 It's warm and cozy, and I love the interplay of color and pattern. Really beautiful! I'd love to settle down for an afternoon in that cheery room. 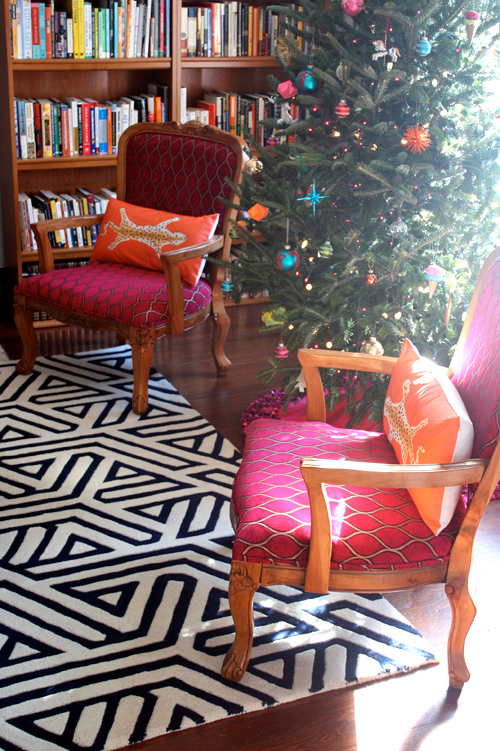 I'm in love with the rug and those pink chairs! WOW! It is looking fabulous! So inspiring! Oh my goodness, it's so crazy pants, and I love it! Such a happy room. Your comment made me very happy, Chelsea. That's exactly the goal. It needs just a few more touches of crazy pants on the mantel and maybe a picture above the lamp behind the loveseat. It's beautiful! Congratulations! I love the nonchalance, I love that nothing matches but everything comes together! Gorgeous - I love that rug!! Can we talk about the tree skirt? I'm searching for a tree skirt and I really love yours. Target! Bought it a week ago! I love this rug! Is the white part of the pattern that bright? It looks so beige on the web. I love it! Ignore that website picture; it's crazy. Not beige at all. I'd call it ivory in person. Really like the decoration of your parlour... just a thought... how about painting the tiles around the fireplace? Good thought! 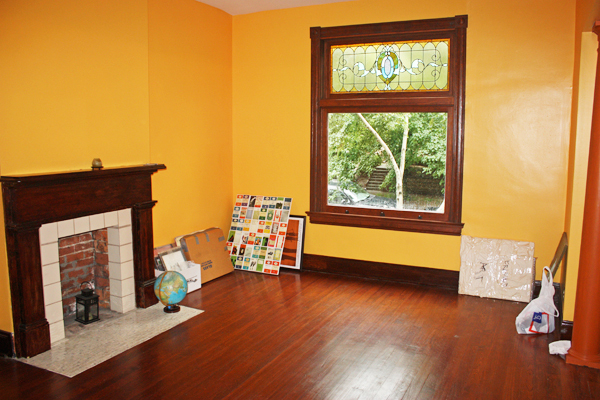 We're still trying to figure out if we want to have actual fire in that fireplace and what our options are for gas inserts and the like. How it needs to function might determine what we can do to it. I love the color combo here and it has given me some ideas for my poor and sad looking living room! This looks so great! 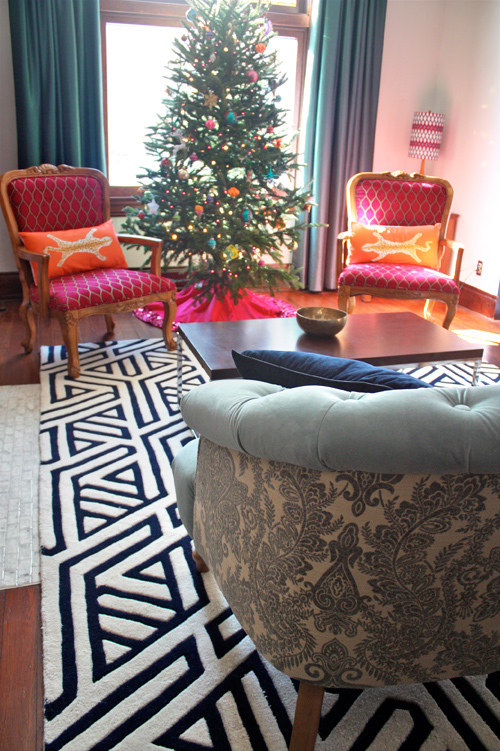 I love the rug with the reupholstered pink chairs especially. Nice work.